learning high-quality instructional tools and professional support services that play a pivotal role in helping the Bill & Melinda Gates Foundation realize its ambitious goal of having 80% of low-income and minority students ready for college by 2025. Click image below for lessons and task for Middle and High School Mathematics. These lessons are Alpha versions created by the Kentucky Department of Education Mathematics Specialists and field tested by Kentucky teachers. The above link has suggested course outlines for implementation of the Formative Assessment Lessons for middle school and high school. Click on the "see more" link in the middle of the home page. 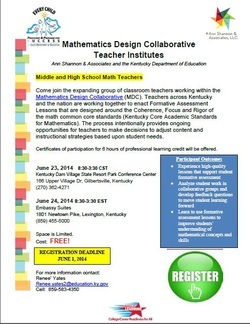 This institute is designed for teachers new to the MDC work. The institute will be led by Dr. Ann Shannon. June 23, 2014 at Kentucky Dam Village State Park Convention Center and June 24, 2014 at the Embassy Suites, Lexington. You may register by clicking on the link above or on the picture. Contact me about MDC work in Kentucky.